This article is about the city. For other uses, see Hereford (disambiguation). Hereford (/ˈhɛrɪfərd/ ( listen)) is a cathedral city, civil parish and county town of Herefordshire, England. It lies on the River Wye, approximately 16 miles (26 km) east of the border with Wales, 24 miles (39 km) southwest of Worcester, and 23 miles (37 km) northwest of Gloucester. With a population of 58,896, it is the largest settlement in the county. The name "Hereford" is said to come from the Anglo-Saxon "here", an army or formation of soldiers, and the "ford", a place for crossing a river. If this is the origin it suggests that Hereford was a place where a body of armed men forded or crossed the Wye. The Welsh name for Hereford is Henffordd, meaning "old road", and probably refers to the Roman road and Roman settlement at nearby Stretton Sugwas. Much of the county of Herefordshire was Welsh-speaking, as reflected in the Welsh names of many places in the county (see History of Herefordshire). An early town charter from 1189 granted by Richard I of England describes it as "Hereford in Wales". Hereford has been recognised as a city since time immemorial, with the status being reconfirmed as recently as October 2000. It is now known chiefly as a trading centre for a wider agricultural and rural area. Products from Hereford include: cider, beer, leather goods, nickel alloys, poultry, chemicals, and cattle, including the famous Hereford breed. Hereford became the seat of Putta, Bishop of Hereford, some time between AD 676 and 688, after which the settlement continued to grow due to its proximity to the border between Mercia and Wales, becoming the Saxon capital of West Mercia by the beginning of the 8th century. Hostilities between the Anglo-Saxons and the Welsh came to a head with the Battle of Hereford in 760, in which the Britons freed themselves from the influence of the English. Hereford was again targeted by the Welsh during their conflict with the Anglo-Saxon King Edward the Confessor in AD 1056 when, supported by Viking allies, Gruffydd ap Llywelyn, King of Gwynedd and Powys, marched on the town and put it to the torch before returning home in triumph. Hereford had the only mint west of the Severn in the reign of Athelstan (924–39), and it was to Hereford, then a border town, that Athelstan summoned the leading Welsh princes. The present Hereford Cathedral dates from the early 12th century, as does the first bridge across the Wye. Former Bishops of Hereford include Saint Thomas de Cantilupe and Lord High Treasurer of England Thomas Charlton. The city gave its name to two suburbs of Paris, France: Maisons-Alfort (population 54,600) and Alfortville (population 36,232), due to a manor built there by Peter of Aigueblanche, Bishop of Hereford, in the middle of the 13th century. Hereford, a base for successive holders of the title Earl of Hereford, was once the site of a castle, Hereford Castle, which rivalled that of Windsor in size and scale. This was a base for repelling Welsh attacks and a secure stronghold for English kings such as King Henry IV when on campaign in the Welsh Marches against Owain Glyndŵr. The castle was dismantled in the 18th century and landscaped into Castle Green. After the Battle of Mortimer's Cross in 1461, during the Wars of the Roses, the defeated Lancastrian leader Owen Tudor (grandfather of the future Henry VII of England) was taken to Hereford by Sir Roger Vaughan and executed in High Town. A plaque now marks the spot of the execution. Vaughan was later himself executed, under a flag of truce, by Owen's son Jasper. The Old House, High Town. This timber-framed Jacobean building, built in 1621, is now a museum. During the civil war the city changed hands several times. On 30 September 1642 Parliamentarians led by Sir Robert Harley and Henry Grey, 1st Earl of Stamford occupied the city without opposition. In December they withdrew to Gloucester because of the presence in the area of a Royalist army under Lord Herbert. The city was again occupied briefly from 23 April to 18 May 1643 by Parliamentarians commanded by Sir William Waller but it was in 1645 that the city saw most action. On 31 July 1645 a Scottish army of 14,000 under Alexander Leslie, 1st Earl of Leven besieged the city but met stiff resistance from its garrison and inhabitants. They withdrew on 1 September when they received news that a force led by King Charles was approaching. The city was finally taken for Parliament on 18 December 1645 by Colonel Birch and Colonel Morgan. King Charles showed his gratitude to the city of Hereford on 16 September 1645 by augmenting the city's coat of arms with the three lions of Richard I of England, ten Scottish Saltires signifying the ten defeated Scottish regiments, a very rare lion crest on top of the coat of arms signifying "defender of the faith" and the even rarer gold-barred peer's helm, found only on the arms of one other municipal authority: those of the City of London. Nell Gwynne, actress and mistress of King Charles II, is said to have been born in Hereford in 1650 (although other towns and cities, notably Oxford, also claim her as their own); Gwynn Street is named after her. Another famous actor born in Hereford is David Garrick (1717–1779). The Bishop's Palace next to the Cathedral was built in 1204 and continually used to the present day. Hereford Cathedral School is also one of the oldest schools in England. The Harold Street Barracks were completed in 1856. During World War I, in 1916, a fire at the Garrick Theatre killed eight young girls who had been performing at a charity concert. The main local government body covering Hereford is Herefordshire Council. Hereford has a "City Council" but this is actually a parish council with city status, and has only limited powers. 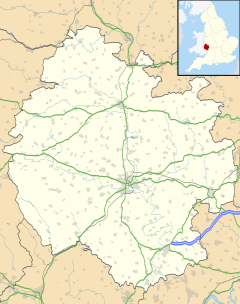 However the new Herefordshire was a unitary authority without any districts, and so Hereford lost its district status (although, confusingly, the authority's full legal name is the County of Herefordshire District Council). Charter Trustees were appointed to preserve mayoral traditions until a civil parish council could be set up, which happened in 2000. Hereford is one of only eight civil parishes in England which have city status. Hereford was the name of a parliamentary constituency centring on the city, from 1295 to 2010, when it was renamed as Hereford and South Herefordshire. The current member of the House of Commons for Hereford and South Herefordshire is Jesse Norman of the Conservative Party. As with all of the UK, Hereford experiences a maritime climate, with limited seasonal temperature ranges, and generally moderate rainfall throughout the year. The nearest Met Office weather station for which 30-year averages are available is Credenhill weather station, about 4 miles (6 km) north east of the city centre. Before 2001, the weather station at Preston Wynne (7 miles, 11 km to the north-east) provided the data. There have been plans for many years for a north–south bypass and currently the plan is for a nine-mile (14 km) dual carriageway; however, HM Government as yet has refused to grant permission or supply funds. However, as of April 2017, Herefordshire Council are doing work on a new Hereford Link Road. Until then the A49 Trunk Road, A465, and A438 continue to run through the city centre. Hereford has been named as the UK's second slowest city with vehicles averaging speeds of 14.09 mph. Hereford is served by a 4-platform railway station on the Welsh Marches Line which opened in 1854. Services regularly connect to Worcester, Birmingham, London, Manchester, Cardiff and other settlements in Wales. The station is currently operated by Transport for Wales. A second station, Hereford Barton, was closed and later redeveloped. In 1999, the British Army Special Air Service (SAS) moved from their base at Stirling Lines in Hereford since 1960 to a former Royal Air Force base RAF Credenhill in Credenhill that had been redeveloped and was designated as Stirling Lines in 2000. The clock tower on which the names of deceased SAS soldiers are inscribed was re-located. In 2005 Hereford was granted Fairtrade City status. Wye Valley Brewery – Producers of such beers as Butty Bach and Hereford Pale Ale (HPA) and other real ales. Many of the schools in Hereford have been rebuilt and improved. The Herefordshire and Ludlow College has also been rebuilt to a 21st-century standard. A new NMITE (New Model in Technology and Engineering) university is also planned, which will teach STEM subjects and was stated to open in 2016, but is now due to intake the first cohort of students in 2019. There has also been a number of improvements at Hereford Sixth Form College, where a new business block extension was completed in 2013 and a new reception area was completed in 2015. A major regeneration project is taking place in Hereford city centre, formerly known as the Edgar Street Grid. This covers an area of around 100 acres (0.40 km2) just north of the old city walls. Work started on 8 October 2012, and should take around 15 years to complete the whole project. The regeneration includes the rebuilding of the canal basin at the end of the currently disused Herefordshire and Gloucestershire Canal. The £80 million phase 1 includes a supermarket, department store, multiplex cinema, shops, restaurants, and other facilities and opened in late Spring 2014. A proposed bypass has been drawn up to circulate the city, which suffers from rush hour traffic, with potential routes either to the east or west of the city. Both routes would connect with the Rotherwas Access Road which was recently completed, connecting the Rotherwas Industrial Estate to the A49. Rotherwas itself has recently been awarded an Enterprise Zone status by the government which is expected to boost the economy and bring in thousands of new jobs. Hereford is due to receive half of the 20,600 new homes expected to be built in the county by 2026 as part of the Regional Spatial Strategy. Hereford United's Edgar Street ground. Hereford is the home of the football club, Hereford FC and they play at Edgar Street in the National League North. They are a phoenix club that was set up in the wake of the demise of Hereford United Football Club in 2014. United were best known for beating Newcastle 2-1 in an FA Cup replay in January 1972, when they were still a non-league side and Newcastle were in the top division of English football. Other notable city clubs include Westfields and Pegasus Juniors. Hereford Rugby Club announced plans in 2012 for a major £6 million move to a new home. Hereford Hockey Club is based at the Hereford City Sports Club, with teams entered into leagues in the West Hockey Association. The city is also home to Hereford Racecourse, a traditional National Hunt course to the north of the city centre which hosted around twenty meetings a year. The company who leased the site decided in 2012 that the site was not viable. What many thought to be the last meeting was held on 16 December 2012, however the course reopened for racing in October 2016. Hereford's public leisure facilities are managed by a not-for-profit trust called HALO Leisure, which runs the Hereford Leisure Centre (that includes huge sports halls, gymnasium, squash courts, and an outdoor athletics facility), and the Hereford Leisure Pool (which includes a gymnasium, full size swimming pool, leisure pool, diving pool, and learners pool). The Hereford Rowing Club (along with the Kayak Club) uses the River Wye; it is a popular club with a junior group. The stretch of river is also used for other water sports. Hereford has a nine pin skittle league, formed on 24 October 1902, and today consists of five divisions. Hereford College of Arts – a publicly funded art school located on Folly Lane, with a Higher Education centre on College Road in the former main buildings of the Royal National College for the Blind. The University of Wales Trinity St Davids co-operate to provide degree qualifications. Herefordshire and Ludlow College (HLC) formerly known as Hereford College of Technology - The Folly Lane facility includes a university centre for the University of Worcester. The National School of Blacksmithing is the oldest established Blacksmithing college in the UK, also the largest facility for training smiths in Europe. [citation needed] This is also part of HLC. The Royal National College for the Blind – One of the top colleges in Europe for blind and visually impaired students, and one of only two in Britain. [citation needed] The college occupies the former Hereford College of Education campus. The college often plays host to major blind sporting competitions like the Blind World Cup 2010 and Euro 2015 Blind Football Championships, and currently hosts the England Blind Football squad training camps. Holme Lacy College – An agricultural college that was part of the Pershore Group of Colleges (now Warwickshire College), but currently belongs to Herefordshire and Ludlow College (HLC). The Steiner Academy Hereford – The first Rudolf Steiner school in England to become an Academy. Aylestone Business and Enterprise College- A co-educational comprehensive school for pupils aged between 11 and 16, created in 1976 by merging two former grammar schools, the Hereford High School for Boys and the Hereford High School for Girls. Specialises in Business and Enterprise. The Bishop of Hereford's Bluecoat School – A co-educational voluntary aided comprehensive school for pupils aged between 11 and 16, formed in 1973 from two former church secondary schools, the Bluecoat foundation, dating back to 1710 and the Bishop’s School, a secondary modern school founded in 1958. It is now a Technology College with a second specialism in Languages. The Hereford Academy – A high school for pupils aged between 11 and 19. It was known as Haywood High School in the late seventies until 2006, when it was renamed as Wyebridge Sports College. As of 1 September 2009 it was renamed The 'Hereford Academy'. It has been, like Whitecross High School, re-classified as a 'Sports College'. The Academy's new building opened in September 2011, and the demolition of the old school site, making way for new playing fields to be laid out, was completed in Spring 2012. Hereford Cathedral School – A co-educational independent school and sixth form, and a member of the Headmasters' and Headmistresses' Conference. The earliest existing records date from 1384 though it is likely that a school was associated with the cathedral from its foundation in the late 7th century. HCS, together with HCJS (see below) educates the choristers for Hereford Cathedral Choir. St Marys RC High School – A Roman Catholic Comprehensive School for boys and girls aged 11–16. The school primarily serves the Catholic Communities of Herefordshire and is situated in a very attractive rural location close to the River Lugg, a few miles to the east of the City of Hereford in the village of Lugwardine. Whitecross Hereford High School – A specialist Sports College, which moved to a brand new PFI building in June 2006. The college for pupils aged between 11 and 16 aims to use the new facility to provide the best high school education for its pupils in the topic of Sports & Fitness. Primary schools in the city include Hereford Cathedral Junior School, a co-educational independent school. Hereford Cathedral Junior School is, with Hereford Cathedral School, part of the ancient Hereford Cathedral Foundation dating back to 676. The Junior School was founded as an independent school in 1898. The City's other primary schools are: Lord Scudamore Academy, St James C of E, St Francis Xavier R.C, Trinity, Holmer C of E, Marlbrook, Riverside, St Martin's, Broadlands, Riverside, Hampton Dene and St Paul's C of E.
In early 2008, Herefordshire Council and NHS Herefordshire became the first local authority and Primary Care Trust to form a new kind of partnership. The major hospital in Hereford is the Hereford County Hospital. Ambulance services are provided by the West Midlands Ambulance Service NHS Trust. The Midlands Air Ambulance charity provides air ambulance services across Herefordshire. With the 2001 foot-and-mouth outbreak the market suffered with trade reduced. Established by Act of Parliament, the market had to be provided, and so a Bill was introduced in 2003 to move the site to the outskirts of the city. The inner city site would then be available for redevelopment, a process that has now finished. Classical composer Sir Edward Elgar lived in Hereford from 1904 to 1911. His association with the city is commemorated with this statue on the Cathedral Close. The annual Three Choirs Festival, originating in the 18th century and one of the oldest music festivals in the British Isles, is held in Hereford every third year, the other venues being Gloucester and Worcester. Composer Sir Edward Elgar lived at Plas Gwyn, Eign Hill, in Hereford between 1904 and 1911, writing some of his most famous works during that time. He is commemorated with a statue on the Cathedral Close. One of his Enigma Variations was inspired by a bulldog named Dan falling into the River Wye at Hereford, and the dog is similarly honoured with a wooden statue beside the river. Not long after moving into the city he was (despite not being a city council member) offered but declined the office of mayor of the city. He also visited the city as a conductor at the Three Choirs Festival, the last occasion in 1933 prior to his death. The hymn tune ‘Hereford’ was written by Samuel Sebastian Wesley (1810-1876). He was an organist at Hereford Cathedral (1832-1835). This tune is often sung to the words ‘O Thou who camest from above’. Polish-born sculptor Walenty Pytel has had studios in Hereford since 1963 after training at Hereford College of Art. The troops of the fictional commando squad Rainbow were based at RAF Hereford, as detailed in the novel Rainbow Six. The action of the fictional novels Shades of Grey and The Last Dragonslayer by Jasper Fforde take place in Hereford. Phil Rickman's Merrily Watkins series of supernatural and mystery novels is set in and around Hereford. Comedy writer Aaron Gillies began writing using Twitter while working as a sound technician at The Courtyard. The local radio stations are Free Radio (formerly known as Wyvern FM) which broadcasts on 97.6-96.7-102.8 FM, Sunshine Radio on 106.2 FM, BBC Hereford and Worcester which broadcasts on 94.7FM, Like Radio Like Music, Like Radio. Digital Radio Station available on DAB, Online and On The Go. The station covers Herefordshire, Worcestershire, Gloucester, Cheltenham and Birmingham. The Hereford Times is the city's only remaining weekly local newspaper as the 'Hereford Journal' ceased publication on 11 June 2014 and the 'Hereford admag' ceased publication in September 2018. Local TV content is currently provided by BBC Midlands Today and ITV Central News. The city's main theatre and cultural venue is the Courtyard Centre for the Arts which was opened in 1998, replacing the New Hereford Theatre. MFA Bowl (formerly known as TGS), home to a Ten Pin Bowling alley and Mini Golf course is located near the railway station. Hereford claims to be the birthplace of Nell Gwyn, 17th-century actress and mistress of King Charles II of England. John Kemble, Catholic priest and martyr, was born near Hereford. Nell Gwyn, David Garrick and Sarah Siddons, actors and actresses, are all historical figures popularly associated with Hereford. Major-General Stringer Lawrence, first commander-in-chief of British troops in India, under whose command Robert Clive served, was born in Hereford. Broadcaster Gilbert Harding was born there when his father was master of the local workhouse, as was contemporary actress Beryl Reid. The original lineup of The Pretenders, with the exception of lead singer Chrissie Hynde, were from Hereford, as were the rock band Mott the Hoople. Frank Oz, puppeteer for The Muppets and Yoda of Star Wars was born in Hereford and lived there for the first five years of his life. Footballer Connor Wickham was born in the city. Ellie Goulding, pop singer and songwriter was born in Hereford. Hereford is the current home of television personality, Wincey Willis. The highwayman William Spiggot declared before his execution to the Ordinary's Accounts of Newgate Prison in London that he was the son of an innkeeper from Hereford. Hereford Cathedral is home to the Hereford Mappa Mundi, a map of the known world from the late 13th century. Hereford Cathedral dates from 1079 and contains the Mappa Mundi, a medieval map of the world dating from the 13th century which was restored in the late 20th century. It also has a chained library. The Old House, Hereford is an historic black and white house in the centre of High Town in Hereford. It is now a museum about life in the Jacobean era of the 1600s when it was built. The Hereford Museum and Art Gallery, housed in a Victorian Gothic building and opened in 1874, presents artefacts, fine art, and decorative art associated with the local area. The Violette Szabo Museum is in Wormelow village, outside the city. Holme Lacy House, now a hotel for a national chain, was built near the city by John Scudamore in the 1500s. It has played host to famous historical figures in its time. Several festivals are hosted in Hereford including the Beer on the Wye festival, the Hereford Food Festival, and the Three Choirs Festival. ^ a b Higgins, Alice. "Visit Herefordshire Archive and Records Centre". www.herefordshire.gov.uk. Archived from the original on 5 March 2016. ^ "The Royal Charters of the City of Hereford". Hereford Web Pages. Archived from the original on 15 January 2012. Retrieved 7 September 2011. ^ "Hereford City Council Charter". Herefordcitycouncil.gov.uk. Archived from the original on 12 February 2012. Retrieved 28 January 2012. ^ "Coat of arms of Hereford (England)". Ngw.nl. Archived from the original on 15 March 2012. Retrieved 28 January 2012. ^ "A History of Hereford". Localhistories.org. Archived from the original on 7 January 2012. Retrieved 28 January 2012. ^ "Plans to demolish former barracks in Harold Street, Hereford to build Hereford Cathedral School boarding school refused". Redditch Advertiser. 16 December 2016. Archived from the original on 24 September 2017. Retrieved 24 September 2017. ^ Chester, Jerry (24 February 2014). "World War One: Hereford theatre fire killed eight at fundraiser". BBC Online. Archived from the original on 3 March 2014. Retrieved 27 February 2014. ^ Office, Met. "Hereford climate". www.metoffice.gov.uk. Archived from the original on 6 September 2015. ^ "July 2006 Maximum". Archived from the original on 24 July 2011. Retrieved 2 March 2011. ^ "December 2010 minimum". Archived from the original on 24 July 2011. Retrieved 2 March 2011. ^ "Archived copy". Archived from the original on 29 January 2016. Retrieved 12 August 2015. CS1 maint: Archived copy as title (link)? ^ "Hereford Times". Hereford Times. 27 February 2009. Archived from the original on 4 April 2012. Retrieved 28 January 2012. ^ Staff (19 May 1980). "World: Britain's SAS. : Who Dares Wins". Time. Archived from the original on 20 January 2011. Retrieved 9 January 2011. ^ "Fairtrade status given in county". BBC News. 6 March 2005. Archived from the original on 17 September 2011. Retrieved 10 December 2007. ^ "Bulmers – Getting things ready for 2012 (winter)". Bulmer.com. Archived from the original on 19 October 2013. Retrieved 28 January 2012. ^ "Special Metals Wiggin Ltd". www.specialmetals.com. Archived from the original on 21 April 2008. Retrieved 16 August 2008. ^ "Cargill Meats Europe". www.cargill.com. Archived from the original on 1 August 2008. Retrieved 16 August 2008. ^ "Painter Brothers". www.painterbrothers.com. Archived from the original on 21 September 2008. Retrieved 16 August 2008. ^ "Update: UBL Ledbury - Cider production to shift to Hereford". Hereford Times. Archived from the original on 7 April 2014. ^ "BBC News". BBC News. 7 August 2009. Retrieved 28 January 2012. ^ "Herefordshire College of Technology". Hct.ac.uk. Archived from the original on 24 January 2012. Retrieved 28 January 2012. ^ "Work Starts on Hereford's Old Cattle Market". Herefordtimes.com. 2 August 2011. Archived from the original on 4 April 2012. Retrieved 28 January 2012. ^ "Stanhope PLC". Stanhope PLC. 5 January 2011. Archived from the original on 30 March 2012. Retrieved 28 January 2012. ^ "Rotherwas named Enterprise Zone". Bbc.co.uk. 17 August 2011. Archived from the original on 4 September 2015. Retrieved 28 January 2012. ^ "West Midlands Regional Spatial Strategy". Wmra.gov.uk. 31 March 2010. Archived from the original on 28 December 2011. Retrieved 28 January 2012. ^ Woodman, Ian (1 September 2011). "Planning permission for new club". Pitchero.com. Archived from the original on 22 October 2012. Retrieved 28 January 2012. ^ "Hereford Hockey Club". Pitchero.com. 13 October 2014. Archived from the original on 17 October 2014. Retrieved 13 October 2014. ^ "Hereford: Horse racing returns after four-year absence following closure". BBC Sport. Archived from the original on 10 October 2016. Retrieved 6 October 2016. ^ "Hereford Skittles Club". Herefordskittles.org. Archived from the original on 16 March 2012. Retrieved 28 January 2012. ^ "New Model in Technology & Engineering - A new model for engineering education". nmite.org.uk. Archived from the original on 7 March 2015. ^ "HCT Rural Crafts Centre". Hct.ac.uk. Archived from the original on 31 January 2012. Retrieved 28 January 2012. ^ "Holme Lacy College". Pershore.ac.uk. Archived from the original on 28 July 2007. Retrieved 28 January 2012. ^ "Holme Lacy Campus". Hct.ac.uk. Archived from the original on 24 January 2012. Retrieved 28 January 2012. ^ "Steiner Academy Hereford". Steineracademyhereford.eu. Archived from the original on 14 December 2011. Retrieved 28 January 2012. ^ "Aylestone School". Aylestone.hereford.sch.uk. Archived from the original on 7 February 2012. Retrieved 28 January 2012. ^ "The Hereford Academy Official Website". Theherefordacademy.org.uk. Archived from the original on 6 March 2012. Retrieved 28 January 2012. ^ "The Hereford Academy's New Building". Theherefordacademy.org.uk. Archived from the original on 6 March 2012. Retrieved 28 January 2012. ^ "Whitecross High School & Sports College". Whitecross.hereford.sch.uk. Archived from the original on 10 February 2012. Retrieved 28 January 2012. ^ "Who are we?". Herefordshire.nhs.uk. 11 January 2010. Archived from the original on 15 March 2011. Retrieved 28 January 2012. ^ "Cattle Market history". Bbc.co.uk. 13 June 2011. Archived from the original on 25 June 2011. Retrieved 28 January 2012. ^ "Hereford Markets Act 2003". Legislation.gov.uk. 30 October 2003. Archived from the original on 7 January 2012. Retrieved 28 January 2012. ^ "New Cattle Market". Bbc.co.uk. 16 June 2011. Archived from the original on 25 June 2011. Retrieved 28 January 2012. ^ "Hereford livestock market move a 'success'". BBC News. 22 November 2011. Archived from the original on 25 November 2011. ^ "BBC Last Choir Standing". Bbc.co.uk. Archived from the original on 30 October 2012. Retrieved 28 January 2012. ^ "Music School | Regenerating Hereford City and County". Herefordfutures.co.uk. Archived from the original on 3 December 2011. Retrieved 28 January 2012. ^ "HEREFORD (Wesley)". Hymnary.org. Archived from the original on 1 January 2018. Retrieved 31 December 2017. ^ "H.Art Week". H-art.herefordshire.gov.uk. Archived from the original on 21 January 2012. Retrieved 28 January 2012. ^ "Hereford High Town life-sized bull statue installed". 13 July 2012. Archived from the original on 20 April 2016 – via www.bbc.co.uk. ^ Fforde, Jasper. "Shades of Grey - sleuth". www.jasperfforde.com. Archived from the original on 19 August 2010. ^ Knight, Adam (20 November 2014). "Major ITV drama to be set and filmed in Herefordshire". Hereford Times. Archived from the original on 13 December 2015. Retrieved 11 February 2016. ^ May, Philippa (4 December 2015). "Tweets lead to publication". Hereford Times. Archived from the original on 13 December 2015. Retrieved 11 February 2016. ^ "Frank Oz". IMDb. Archived from the original on 26 December 2008. ^ Morgan, Ian (14 May 2010). "Bright future ahead for Ipswich Town's Connor Wickham". Hereford Times. Archived from the original on 4 April 2012. Retrieved 16 May 2010. ^ Emsley, Clive; Hitchcock, Tim; Shoemaker, Robert. "The Proceedings - Ordinary of Newgate's Accounts". Old Bailey Proceedings Online. 7.0. Archived from the original on 15 October 2015. Retrieved 28 October 2015. ^ "Ordinary of Newgate's Account, February 1721 (OA17210208)". Old Bailey Proceedings Online. 7.2. Archived from the original on 26 December 2015. Retrieved 28 October 2015. ^ "Mappa Mundi". Herefordcathedral.org. Archived from the original on 26 January 2012. Retrieved 28 January 2012. ^ "Warner Holidays". Warnerleisurehotels.co.uk. Archived from the original on 1 March 2012. Retrieved 28 January 2012.